It’s been a while once more… So, at first, wish one and all a very happy new year.. A wonderful year, that started with the Supermoon… The 2nd was Arudra Darshan, the day sacred to Nataraja, the Dancing Lord, Shiva… And today, 3rd Jan, 2018, is the Jayanti of Sri Ramana Maharshi. 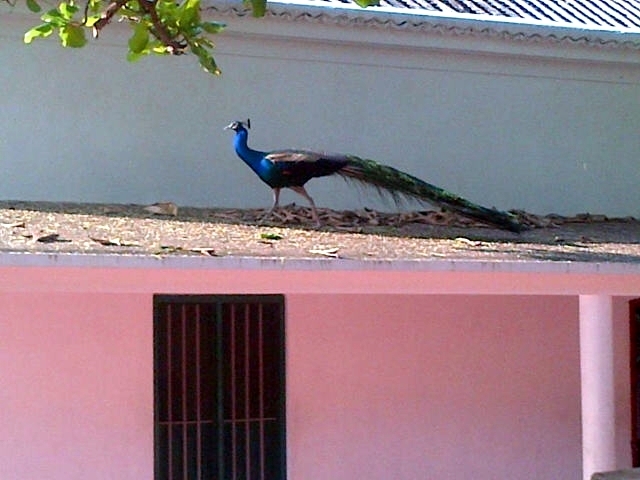 The star of Punarvasu, month of Margazhi, one day after the Arudra Darshana…. Upadesha Saram is one of the finest treatises in Vedanta. Ramana Maharshi had first composed it in Tamil (title ‘Upadesha Undiyar’) sometime in 1920-s, and also composed the same treatise in Sanskrit, Telugu and Malayalam as well. In just thirty beautiful verses, the whole ocean of Vedanta philosophy is conveyed in all simplicity, directness and beauty. In 1928 CE, Kavaykantha Ganapathi Muni wrote a Sanskrit commentary on ‘Upadesha Saram’. This was published by Sri Ramanasramam in 1941. And in 1950-s a young Dandi Swami (monk), from North India, wrote a Hindi commentary, based on Muni’s Sanskrit Commentary. That young Sanyasi, Swami Swaroopananda Saraswati, now adorns the Holy Peetham of Dwarka as the Jagadguru Shankaracharya. By great good fortune, I was blessed to translate the treatise and the two commentaries into English. This was serialized in the ‘Ramana Way’ magazine, of Ramana Maharshi Centre for Learning, Bengaluru. And now, the revised version has been compiled as a book, ‘Upadesha Saaram of Bhagavan Sri Ramana Maharshi, with Bhashya and Translation.’ This book was offered today, on Ramana Jayanti day, at the altar of Ramana, at Sri Ramanasramam. Hope to publish this as an ebook as well, very soon…. 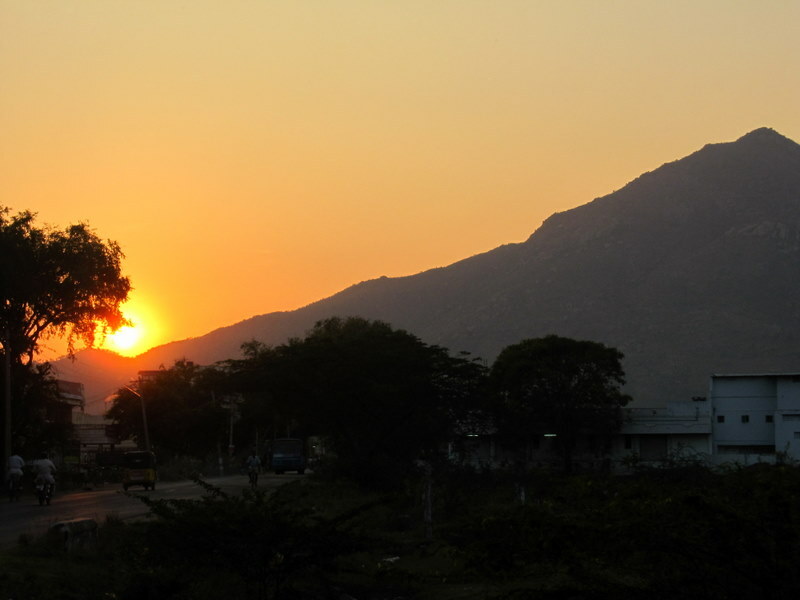 Let us travel to Arunachala, shall we…. Some pictures first from the Kumbhabhishekam function at Sri Ramanasramam, that was concluded on August 25th 2013… Pictures start with some scenes from the ‘Walk Around Siva” Giripradakshanam that one did on the previous day… And then moves on to the Homa and Kumbhabhishekam the next day. And after the gallery below, check out some videos, three from this function… And one from over seventy years ago. Jai Ho! Let us move on…. Sankalpa for the Holy Consecration! First one, a clip from the Homa done on 25th Morning. 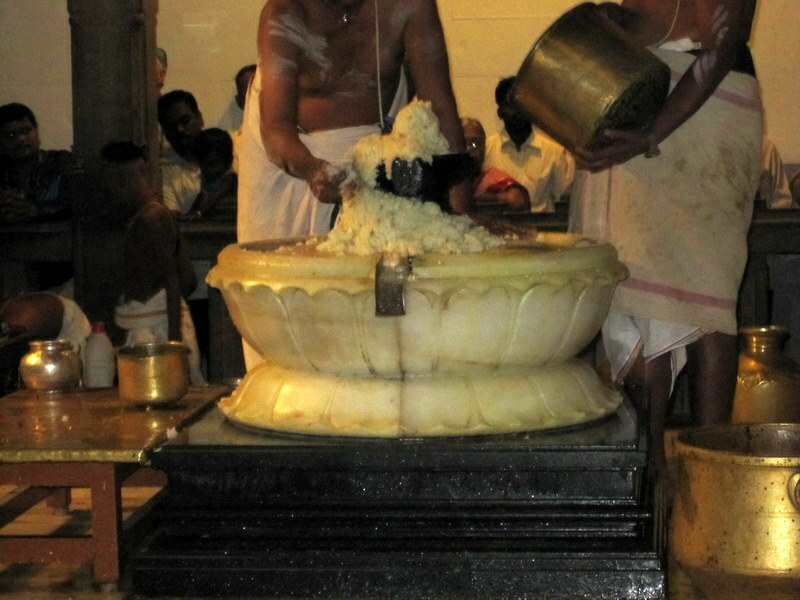 After the pouring of sanctified waters on the kalasha on top of the towers (Gopuram), Abhishekam is performed at the Siva Linga in the Ramaneshvara shrine….. 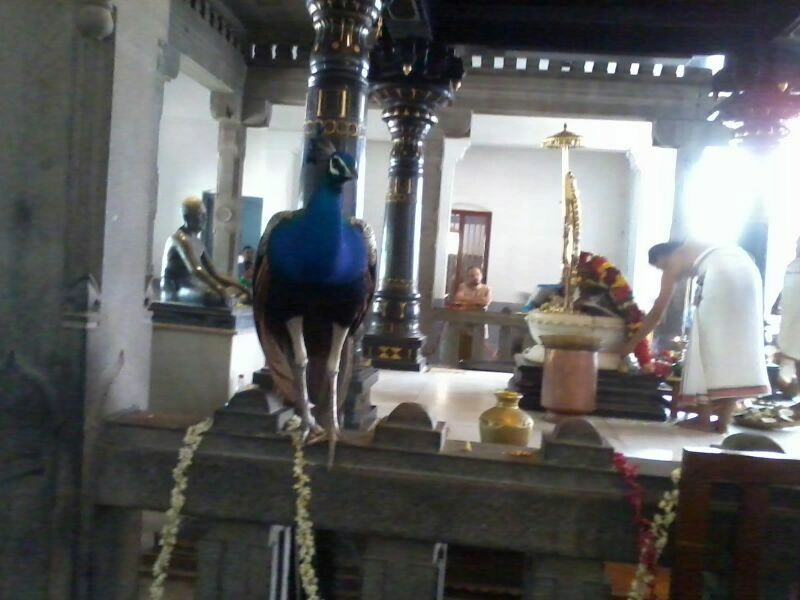 The Ramaneshvara Mahalingam.. This great good fortune of appearing in a Ramanasrama footage is a legacy from my grandfather, Dr Vaidyanathan. He is seen in the December 1948 Archival film of Ramanasramam, when the Asram was celebrating 69th Jayanthi (Birthday) of Bhagavan Ramana. Yesterday, June 2, 2013, was the Thithi of Mahanirvana of Mother Azhagammal, the sage lady who was mother of Sri Ramana Maharshi. She was absorbed in the radiance of the Self on May 19, 1922. 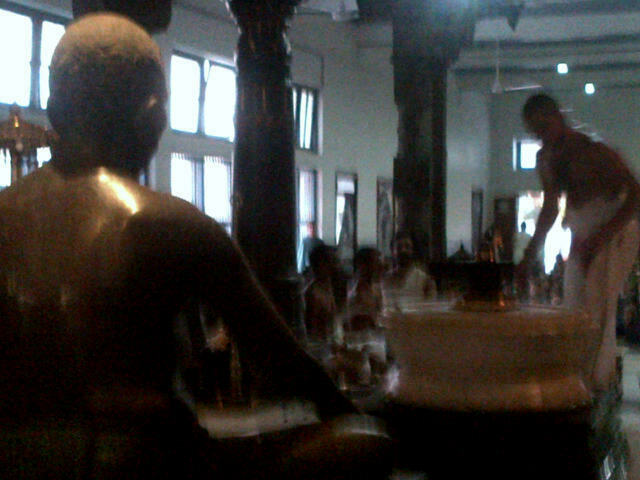 Her absorption day has been celebrated as Maha Puja day, every year. 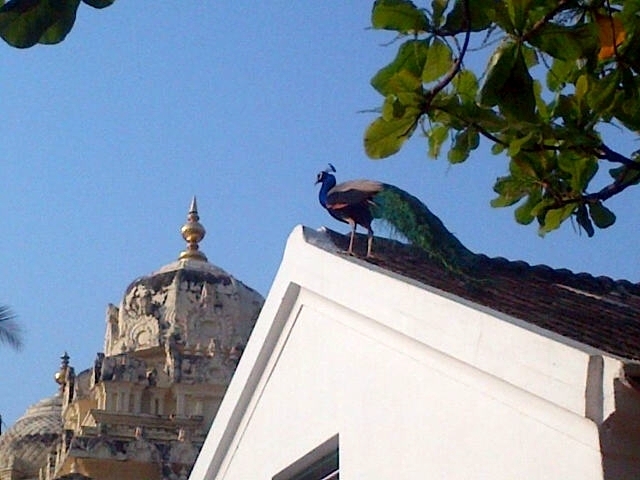 Yes, a peacock nonchalantly perched itself on the parapet next to Bhagavan’s shrine. 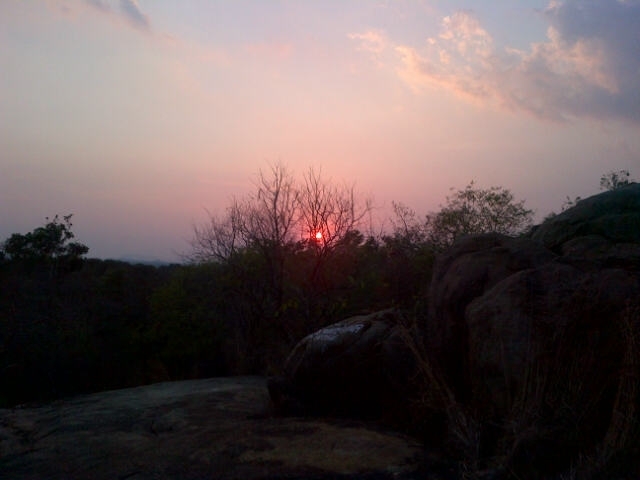 And it was looking directly at the Mother’s temple. 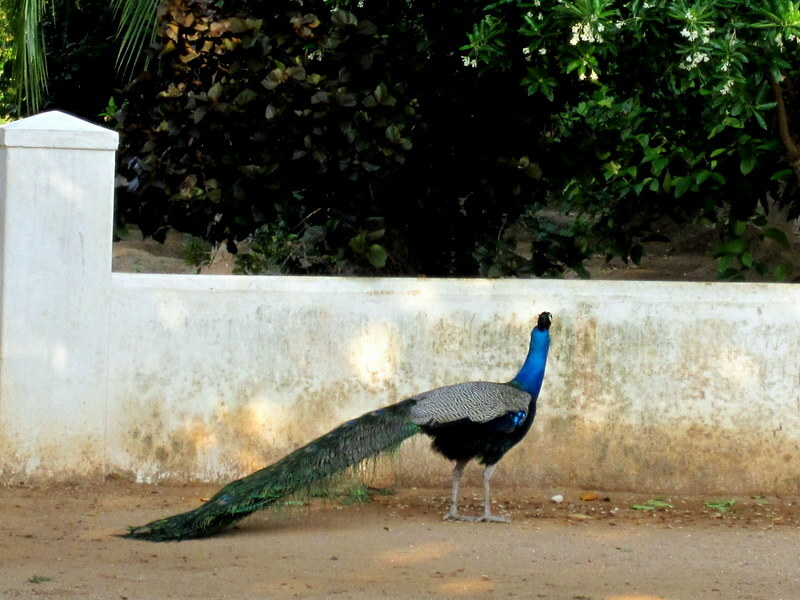 Here’s the position of the peacock. 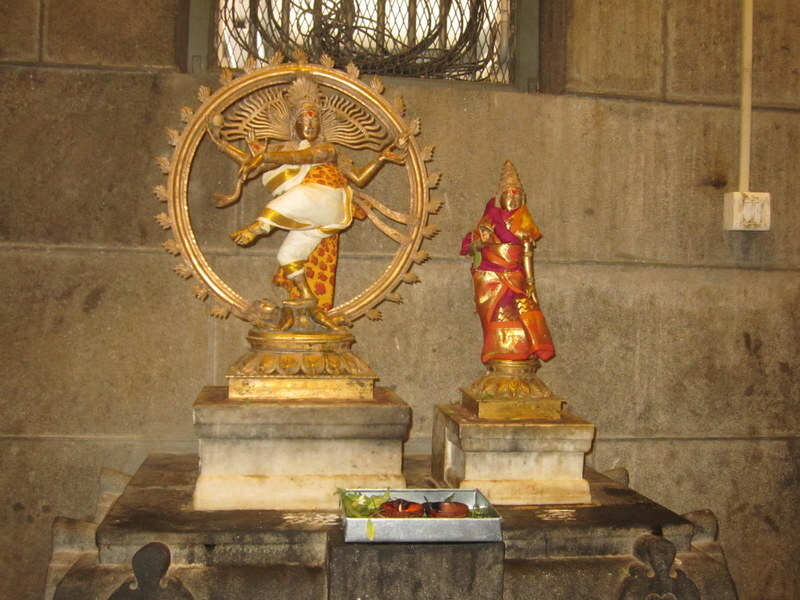 In its line of vision, if you bore a hole through the wall, you would land up directly into the sanctum sanctorum of Mathrubhutheswara Mahasannidhanam (Mother’s shrine). 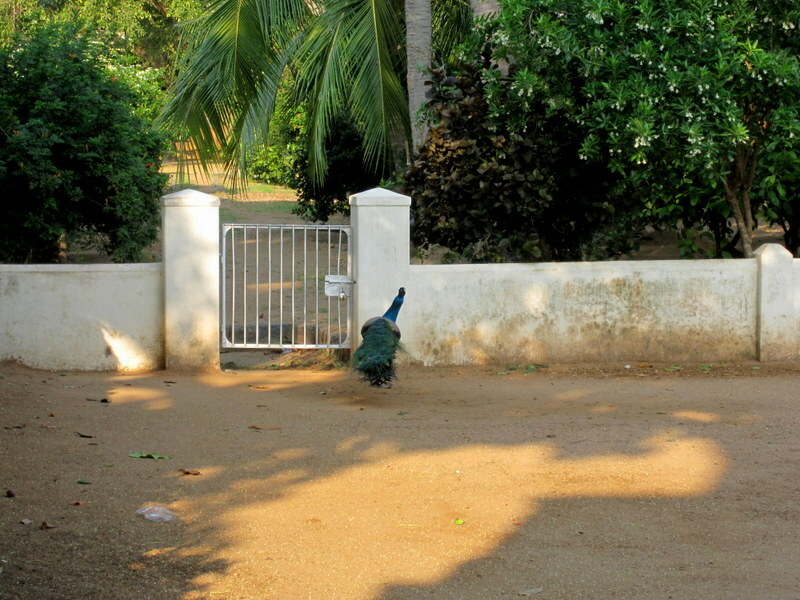 Peacocks are by nature very timid… You can see them in good numbers in Ramanasramam. But they keep away from humans. And certainly, they do not enter into crowds. Yesterday was Maha Puja day. 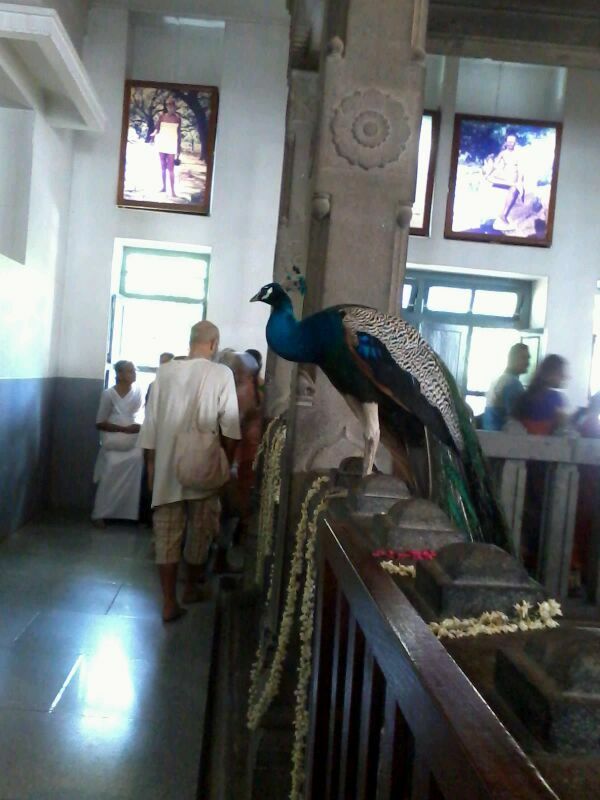 The hall was crowded with devotees. Worship was in progress. 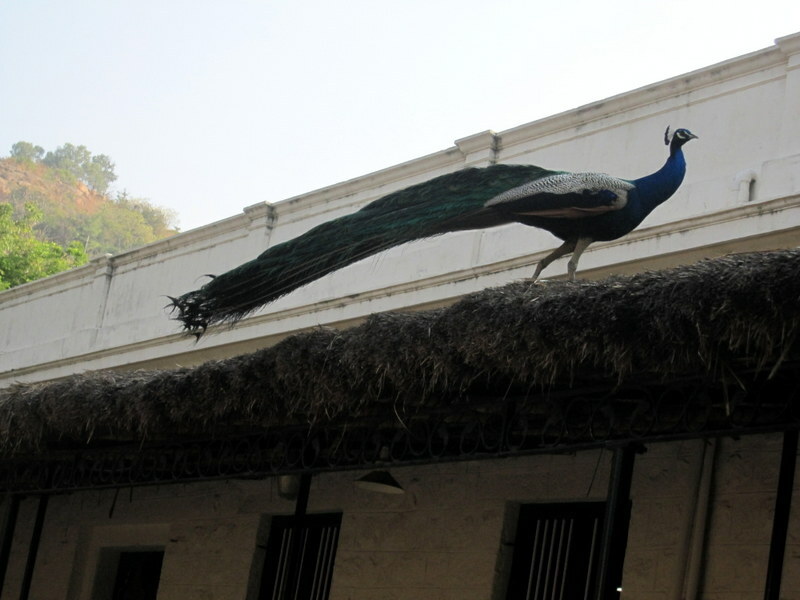 Completely unconcerned with the throng of people, the peacock was just focused on looking on at the mother’s temple. Lots of devotees went and took pictures. 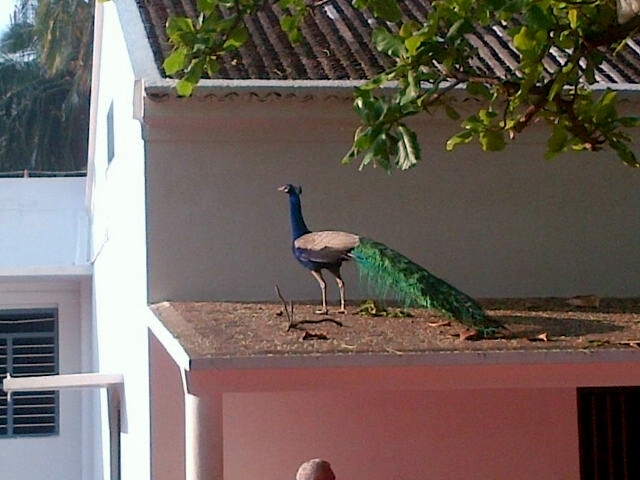 The peacock did not bother the least. 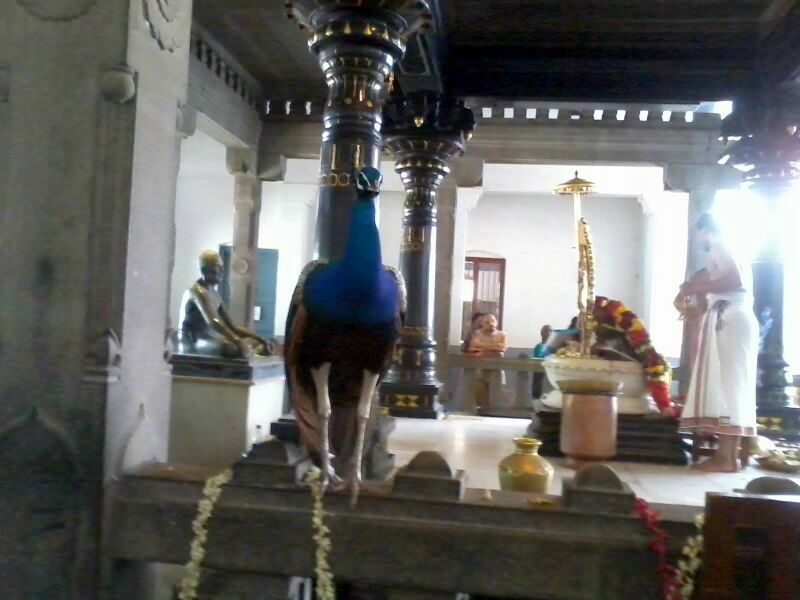 Some offered some grains, which the peacock royally ignored. Sometimes he cleared his throat in a silent sigh. 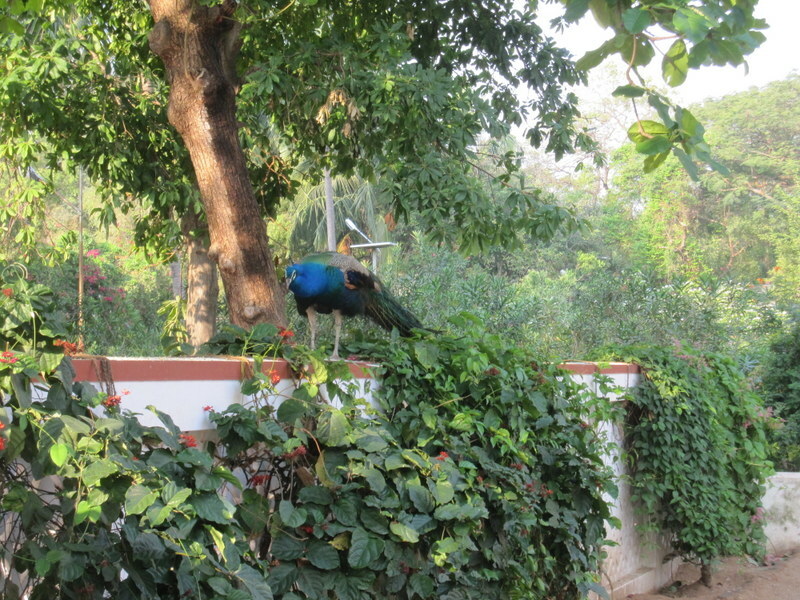 But this bird came…. And he just remained there, in silence. As if he had brought Skanda Ramana, Murukan, to see the worship of the Lord (Siva) Who Came as (His) Mother, Mathrubhooteshwara (Taayumaanavar). Signing off this post with one more picture. Chalo, lets take a walk around Sri Ramanasramam! 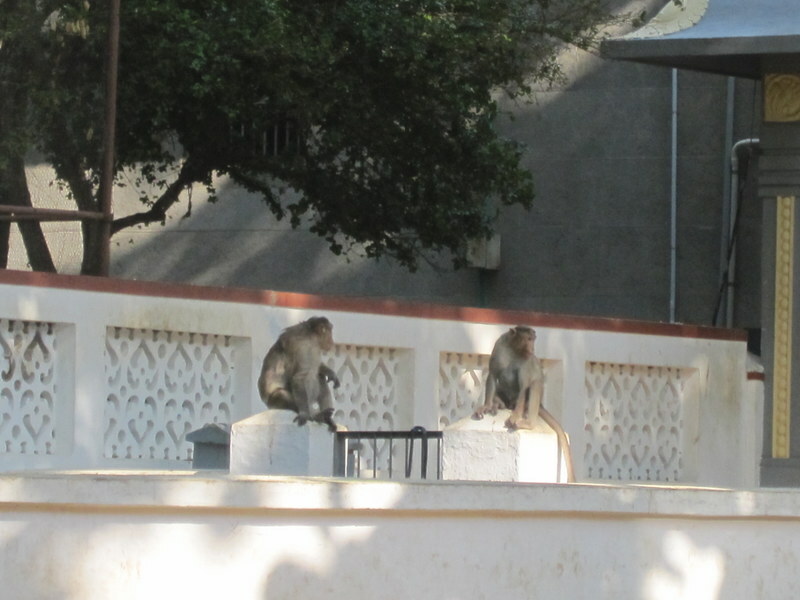 These two fellows sitting near the well are guarding the area..
Shall we take a peek across the roof? Whoa! What do we have here! He’s my kind of guy! What joy! 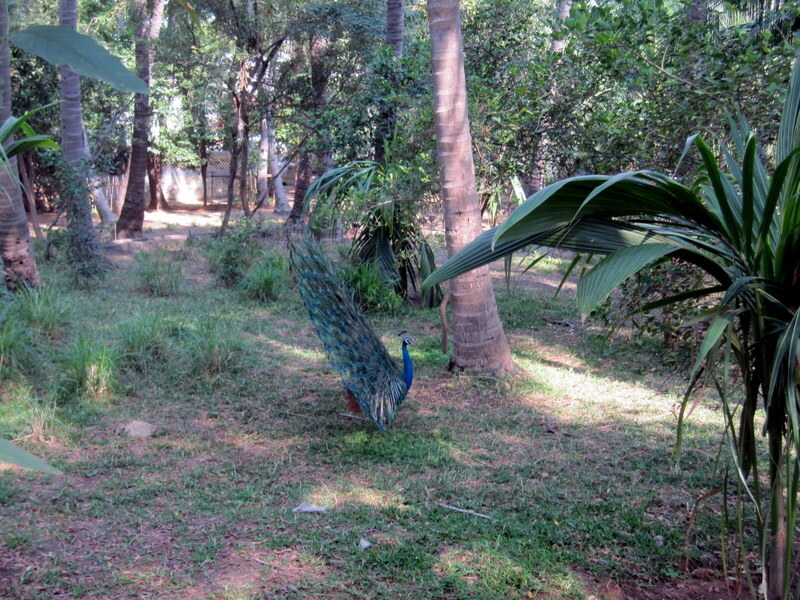 All right… Let’s move on to the peacock grove…. 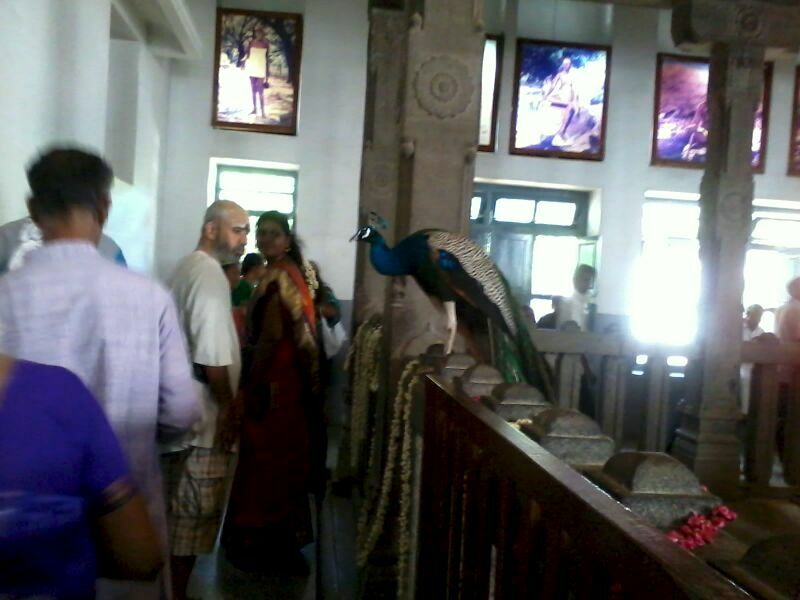 Sree Rama Jayam! Jai Hanuman! Now, to walk around Siva! 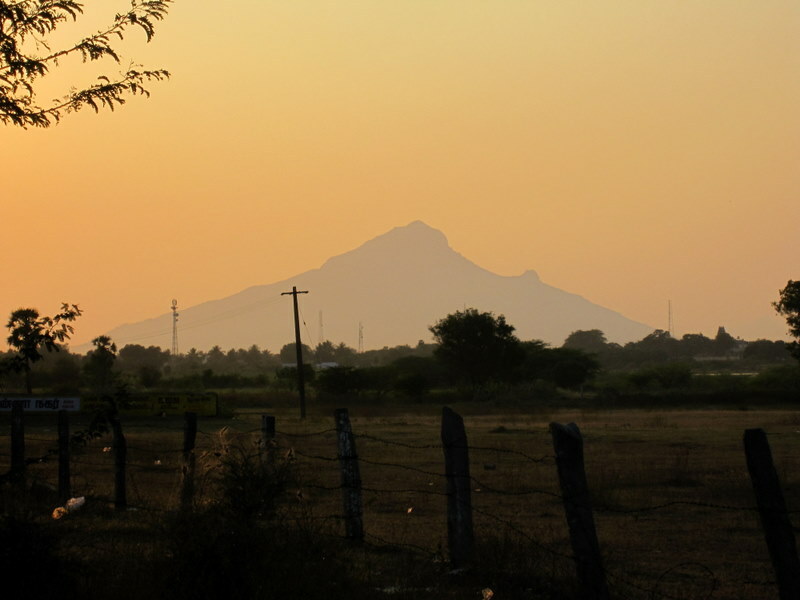 Setting off on the holy walk around Siva…. 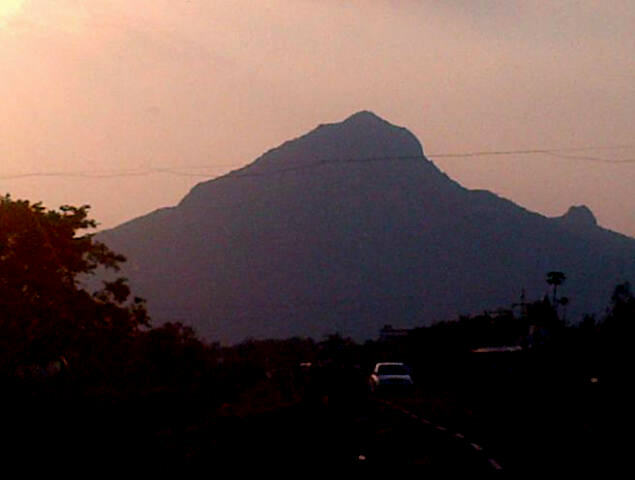 Giripradakshina….